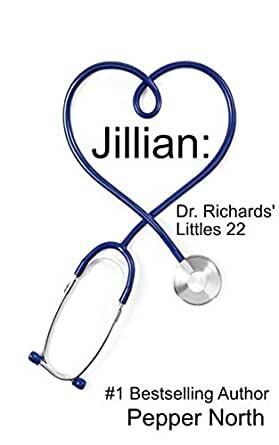 Jillian has worked for Dr. Richards for many years. She has watched happy Littles and their Daddies and Mommies come to visit for doctor's visits and for fun Little gatherings. Could it be her time again to be Little? WHACK! The cart shook in Jillian’s hands as she rounded the corner running into another cart. Looking down to see that her eggs were unbroken, she automatically began apologizing, “I’m so sorry. I should have taken that corner more slowly …” her voice trailed off as her eyes ran across her basket to the one she’d run into and up an incredibly muscled torso past wide shoulders to an extremely handsome face. An electric zing of awareness tingled through her body as their eyes met. “Now I understand the term, silver fox!” she whispered not realizing that she was still speaking out loud. “I’m not a little girl,” Jillian automatically corrected waving a hand at her slightly padded curves. She failed to notice his emphasis on the word Little. “Your Daddy should have taught you not to argue with your elders, Little girl,” he gently corrected with a smile. Griffin has been looking for his Little girl for many years. Can this handsome yoga instructor convince Jillian to be Little again? Some of the characters from the first twenty-one novels in the Dr. Richards' Littles series reappear to continue their stories. You do not need to read the stories in order. The books do not necessarily take place in chronological order. All are complete stories. I have every one of the "Dr. Richards' Littles" books. To show you how much I like them, I'll tell you that I have reread the entire series 3 times. Really! To a certain extent, the stories do tend to be the same, but they make me feel good. There is love here and the stories vary enough that each relationship is unique. In this book, the couple is older (thank you Pepper!) and it's about time that this type of relationship is explored. Unfortunately, I don't think that enough emphasis was placed on this fact. Griffin has some grey hair and Jillian is in her 50's and this couple's unique attraction should take center stage here. It's what makes them unique in a 21+ volume set of younger Littles. Despite this oversight, I was very happy to see Jillian get her own story told. After all, Paul (the butler) had his story told way back in book 5. I question Jillian's identification as a Little, however. All of the other books depict her as a nurturing woman who takes care of the Littles who come to Dr. Richards' practice. I don't see Zoey, Angelina, Brad, Jake and the other Littles having that type of personality. Anne, Paul, April, Matt Richards and all the other Daddies and Mommies are described in just the same manner, though. I have noticed that the editing in the "Dr. Richards' Littles" books seem to has gotten worse as the series goes on. This is probably the main reason that I've given this only 4 stars. There are misspellings, incorrectly used words, and repeated words which have been common in all of the books. Zoey's story was the best written and edited book of the series. None of these criticisms take away from the actual stories and I will continue to purchase, read and reread the books. They make me feel good. They are a D/s relationship that nurtures and I think that loving, supportive relationship is what almost all of us want. Discipline and punishment are not unearned and they're appropriate to the misdeed. This is a loving, consensual and safe environment where consenting adults come together. They're happy. I'm happy. It's a win-win. 3.0 out of 5 starsMissing a few somethings. All these books pretty much jump straight into the relationship, almost. This one was over the top quick which might make sense for a very young couple but not a mature older couple. He should have been more of a gentleman and "courted" her because that’s what they did in his time. This would have shown his older maturity and set him apart from all the other couples. Plus half the fun is the chase. Bumping into someone is not a date and it’s very superficial for him to think “She’s the one” when he doesn’t know anything about her and it doesn’t replace getting to know her better before taking them to your home. Sorry pepper I didn't like this one. It may have ended well like another reviewer suggested but I couldn't get over that she was naked, doing things that you don’t do in the home of a complete stranger and calling him daddy within a few combined hours of knowing each other. I think a little self consciousness and mutual respect might have gone along way here. Books generally have a start, middle and an end. This one was missing it’s start, the bit that leads to part that makes you go aww when they finally get together. I'm so glad Jillian got her story. She loves the Littles and deserved to have her ever after. Cant wait for more!